The decline of Keynesianism preluded the retreat of the state. In the United States market fundamentalism that rose in it’s place and it began to manifest it’s self as profit motive in sectors afore untouched by such. Higher education is seeing more and more as the supply side to meet skilled market labor demand. Increasingly the market orientation is incentivizing a profit motive with in higher education. Although Germany has as state coordinated higher education sector and a Coordinated Market Economy there has been significant policy movement in a market-oriented direction. 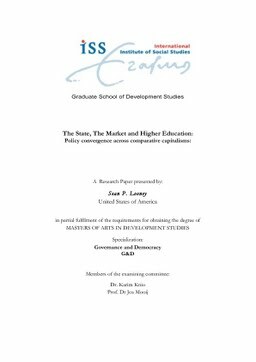 This paper answer the question ‘has market incentization lead the German higher educational system toward convergence with the American higher education system?’ The Varieties of capitalism literature is utilized to determine the degree of convergence. Although there are significant elements of neoliberal policy coming to bare, this paper finds that the structures, institutional complementarities, state coordinated higher education sector and Germany Coordinated Market Economy provide structural barriers for stop sudden transition. The principles of the system are still the same and appear capable and willing to resist the tide of market influence and the pure economistic interpretation of the role of higher education.